Thirty-five years ago today (Sept. 17), Americans got their first good look at a spaceship that would become a national icon. On Sept. 17, 1976, NASA's prototype space shuttle Enterprise was rolled out of its assembly facility in Southern California and displayed before a crowd several thousand strong. Though Enterprise was a test vehicle that never reached space, its completion in some ways marked the true beginning of the space shuttle era. 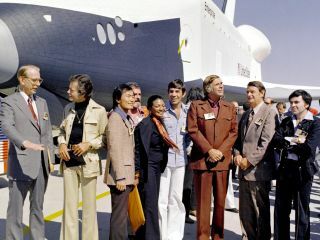 Various dignitaries were on hand to mark the occasion, including many castmembers from the original "Star Trek" television series, which had debuted 10 years earlier (the 45th anniversary of "Star Trek" was last week). Their presence was appropriate, as the prototype shuttle took its name from the sleek starship commanded by the fictional Captain James Tiberius Kirk. Though Enterprise broadly resembled future space shuttles, the prototype differed in several key ways. "At its core — its airframe — Enterprise was like its space-worthy shuttle siblings, but it was never outfitted with many of the systems that would have ultimately made it capable of orbiting the Earth," said space history expert Robert Pearlman, editor of the website collectSPACE.com and a frequent SPACE.com contributor. "For example," Pearlman added, "its outer surface was mostly fiberglass instead of the thermal protection system tiles and (later) blankets that covered [the shuttle] Columbia." The space shuttle prototype Enterprise flies free after being released from NASA's 747 Shuttle Carrier Aircraft over Rogers Dry Lakebed during the second of five free flights carried out at the Dryden Flight Research Center, in Edwards, Calif., as part of the shuttle program's Approach and Landing Tests (ALT). The tests were conducted to verify aerodynamics and handling characteristics in preparation for orbital flights with the Space Shuttle Columbia, which began in April 1981. On Jan. 31, 1977, NASA transported Enterprise 36 miles (58 kilometers) overland to the space agency's Dryden Flight Research Facility at Edwards Air Force Base. Over the next nine months, NASA engineers put Enterprise through a series of ground and flight tests. These trials proved out the shuttle's design, demonstrating its airworthiness and landing abilities. Then, from 1978 to 1985, Enterprise was ferried to various NASA centers, where it served as a sort of practice tool for engineers working on flight-ready space shuttles. Enterprise "was the 'fit-check' vehicle for the space shuttle on two launch pads — Complex 39 at the Kennedy Space Center, Fla. and SLC-6 at Vandenberg Air Force Base, Calif.," Pearlman told SPACE.com in an email. Enterprise also traveled the world as a showpiece, making stops in Canada, France, Italy, Germany and England in 1983. The orbiter also journeyed to New Orleans for the 1984 World's Fair. In 1985, NASA handed Enterprise over to the Smithsonian Institution's National Air and Space Museum near Washington, D.C. It still sits there today, but the shuttle will soon be heading to the Intrepid Sea, Air & Space Museum in New York City. Columbia made the shuttle program's first spaceflight in April 1981 but was lost along with its entire seven-astronaut crew in a 2003 re-entry accident. Challenger exploded shortly after liftoff in January 1986, killing all seven crewmembers onboard. The Challenger tragedy spurred NASA officials to think about sending Enterprise to space, Pearlman said. "After Challenger was lost, NASA briefly considered retrofitting Enterprise to become its replacement, but ultimately found using the spare components left over from building Discovery and Atlantis to assemble Endeavour a more cost-effective approach," Pearlman said. The space shuttle fleet was grounded after Atlantis' STS-135 mission landed this past July. The remaining orbiters are headed to museum retirement homes. Discovery will go to the Smithsonian, which is why Enterprise is being shipped out to New York. Atlantis will be displayed at the Kennedy Space Center Visitor Complex in Florida, while the California Science Center in Los Angeles gets Endeavour.